Despite a high demand for donor hearts and a well-established transplant process, 20 percent of donated hearts are not used because organ procurement agencies cannot find a recipient in time. Asporto, Hibernicor’s heart transplant device, improves and prolongs organ preservation for transplantation of donor hearts. Increase the number of viable donor hearts by 20%. Provide time to perform tissue matching, resulting in fewer organ rejections. Decrease immediate post-operative morbidity and mortality. Shorten pre-transplant waiting list time by 1 month. Reduce medical costs 1 year after transplantation. Decrease net operating costs for transplant centers. Procure donor hearts in remote areas from an expanded geographic area. Roughly the size of a 16-quart portable cooler, Asporto is an electronic medical device which controls the administration of a saline-based fluid to the donor heart during cold (hypothermic) storage. The heart is placed in a sterile heart container and placed in the Asporto device. 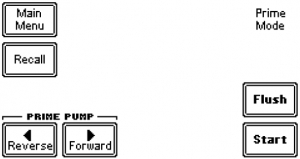 A peristaltic pump moves fluid contained in an intravenous bag to the aortic root of the donor heart while keeping the heart cold. 1. Prime and flush the heart in preparation for storage. 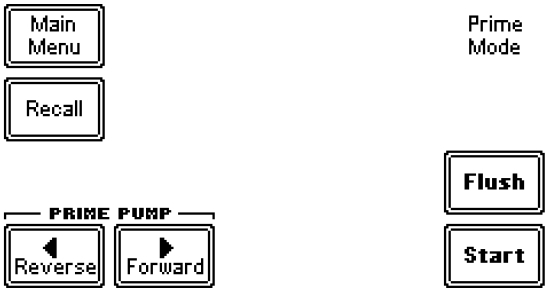 A simple screen allows the transplant professional to control the pump priming to evacuate air from the system. 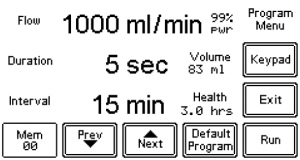 If a large volume cardioplegic flush is needed, this can be initiated from this screen. 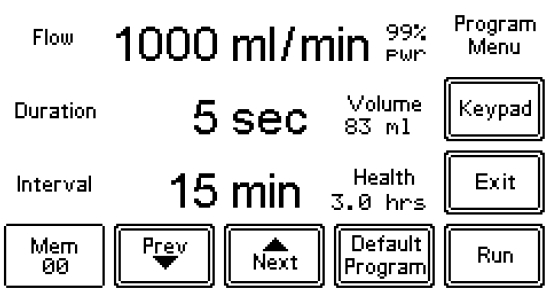 When ready the “Start” button initiates the default perfusion program. 2. Control the amount of fluid being circulated in the heart using a predetermined program. The flow (ml/min), duration (sec), and interval (min) can be stored in 25 different settings and only one is the predetermined default for organ preservation. Temperature – Keeping hearts in a hypothermic state between 5 and 8°C preserves the organ by slowing down the rate of tissue degradation by reducing cellular energy demands and enzymatic activity. Perfusion – Cardioplegic (saline) is pumped into the aorta and into coronary arteries moving damaging metabolites (such as lactic acid) out of the capillaries of the heart. Improving donor heart viability allows transplant centers to increase net operating margins and decrease peri-operative costs.